Beautiful Jackson County is west of Asheville and includes the towns of Cashiers, Cherokee, Dillsboro, Sylva, Balsam, Cullowhee, Lake Glenville (pic above) and Sapphire. 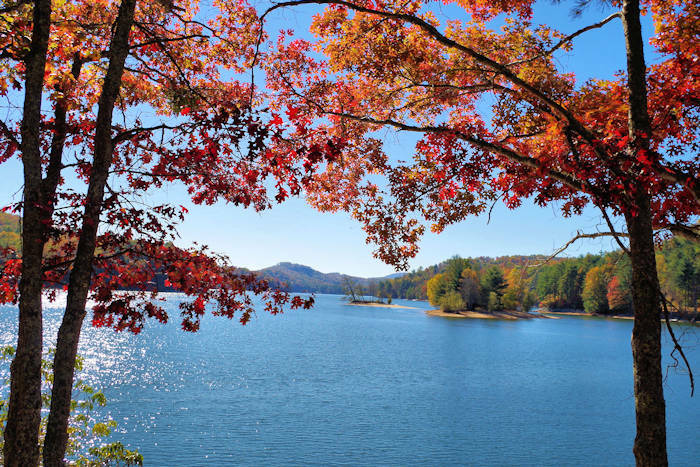 In addition to great small towns to visit, explore the unspoiled Nantahala National Forest with hiking, fishing, rafting and waterfall hunting in the North Carolina mountains. It is home to the final stretch of the Blue Ridge Parkway with more than 40 miles of uncrowded scenic beauty. 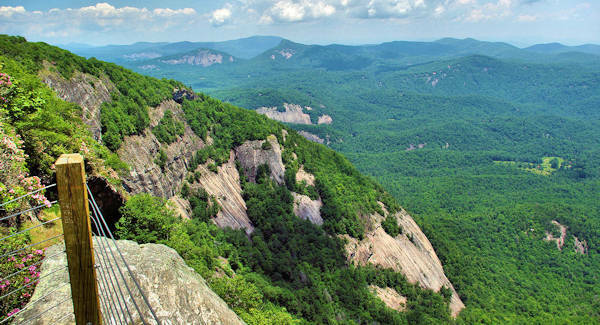 From Devil's Courthouse to Cherokee, this is the highest section of the Parkway. Stop and hike at Richland Balsam Overlook, the highest point on the Blue Ridge Parkway at 6,053 ft. elevation. Also, hike to the top of Waterrock Knob with sunset views over the Great Smoky Mountains. 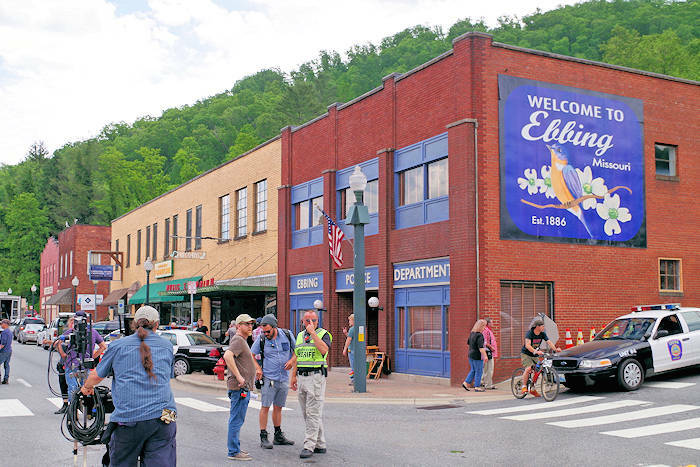 Recently, it's the film location for several movies, including Three Billboards Outside Ebbing. Go to the Jackson County website for more attractions and great places to stay, including the great small towns of Cashiers, Cherokee, Dillsboro, Sylva, Balsam, Cullowhee, Glenville and Sapphire. Tour this fascinating arts facility that is powered by methane gas captured from the old town landfill, providing heat for blacksmith forges, metal foundry, glassblowing, greenhouses and heating. Their gallery features art made on-site. See the country's smallest post office, located roadside near Cashiers and open every day. Fun photo spot! Also see nearby Zachary-Tolbert House. Unwind on Fridays Memorial Day through Labor Day with live music outdoors in downtown Sylva. Shows are 7-9 PM at the Bridge Park. It's just two blocks from Main Street with shops, restaurants and breweries (come early!). Family friendly with a big variety of music. Bring a chair or blanket. Free. Watch this highlights video from Jackson County! Water Fun: Swimming, sailing, water skiing, boating, tubing, whitewater rafting, kayaking and canoeing are all available in Jackson County. There are four whitewater rivers, the Tuckasegee, Chattooga, Oconaluftee and the nearby Nantahala, with difficulty ranging from Class I to Class VI. Commercial companies rent rafts, canoes, kayaks and tubes. Canoes and boat rentals are available on Lake Glenville. The Vordach Zip Line Adventurers of all ages can enjoy an exciting and picturesque experience at The Vordach above Ski Sapphire Valley. 8-11-year-old beginners can work their way to the top on a green course while 12+ ages take a full scenic canopy tour through the treetops. Ski Sapphire Valley: Ski or snowboard down the slopes in Sapphire Valley. The resort offers lifts, rentals, ski school and more. Snow tube at Frozen Falls Tube Park at the resort and stay at one of the lodging options for the weekend to enjoy a winter wonderland with the family. Smoky Mountain River Adventures: Located on Highway 74 West outside of Dillsboro, find fun for the whole family at Tuckasegee River Trips. The perfect place for groups to enjoy the water on rafts, kayaks, double kayaks or tubes. Raft in the morning then enjoy tubing or hiking one of the recommended trails during the rest of the day. Carolina Outfitters Whitewater Rafting Enjoy the scenic splendor of the Nantahala National Forest and the Great Smoky Mountains as you paddle the clean cold waters of the Nantahala or Ocoee River. With class II, III and IV whitewater rapids, the river is fun and exciting but does not require previous experience. Paddlers of all levels enjoy the journey. The river is dam-controlled and there is a good, dependable water supply for whitewater rafting all season long! Innovation Brewing: Truly innovating, these brewers experiment with a variety of fun and fresh ingredients always ready to stimulate the palate and senses of visitors coming in for a pint. Located in Sylva, this brewery certainly specializes in beer with 22 beers on tap and brewery merchandise to match. Western Carolina University is a member of the University of North Carolina system, with 9,000 students in the small town of Cullowhee. For visitors, their Fine and Performing Arts Center is an exciting cultural arts and art education destination with world-class performers and artists. The Fine Art Museum includes nearly 10,000 ft. of exhibit space featuring a growing permanent collection, an exciting schedule of contemporary art and fine crafts, and related interdisciplinary education programs. Go to the Jackson County website for more attractions and great places to stay, including Cashiers, Cherokee, Dillsboro, Sylva, Balsam, Cullowhee, Glenville and Sapphire.